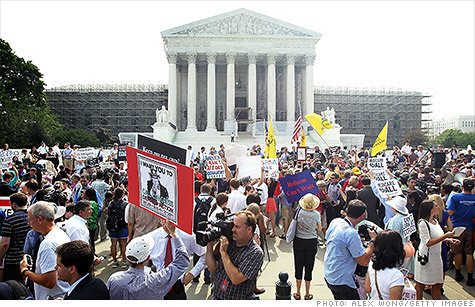 With the Supreme Court ruling, health reform rules and options for business stay in place. NEW YORK (CNNMoney) -- Health care reform has survived the Supreme Court, and that means a flood of new rules and options for American businesses and their employees. For most small businesses, the court's decision Thursday means a new way for them to shop for less expensive health insurance on state exchanges. The ruling also means that companies with 50 or more full-time employees must start providing health insurance for all workers by 2014 or face stiff penalties. The 2010 Affordable Care Act survived because the most controversial part of it was deemed constitutional -- the individual mandate forcing every person to buy health insurance. The mandate also adds a major cost to solo entrepreneurs -- those with no employees -- who must now buy health insurance for themselves or pay a fine. But solo entrepreneurs also get the new option to buy insurance on state exchanges, which are intended to lower costs for everyone by expanding the pool of insured and spreading out risk. Five provisions affect businesses directly, and all survived the legal challenge by the National Federation of Independent Business, a powerful small business lobbying group. Fines: Any company with at least 50 full-time employees must start providing insurance to staff in 2014. If they don't and a single worker turns to the government for a health care tax credit or subsidy on the exchanges, then the company has to pay fines. It won't be cheap. The penalty starts at $40,000, and increases with the size of the firm's workforce by $2,000 for each additional worker past 50. And it won't be enough to provide just any insurance, either. The plan must cover at least 60% of health care expenses, and insurance has to cost the employee less than 9.5% of his or her family's salary. If coverage is deemed substandard by those measures, the company is hit with an even higher penalty of $3,000 per employee. It's a stiff rule that many fear, but it doesn't affect the majority of the nation's nearly six million employers. Government statistics show 200,000 small businesses will face the new rule. The rest, however, have no obligation to cover employees. Individual mandate: Everyone must purchase some sort of health insurance by 2014. At companies with fewer than 50 workers, that responsibility falls on the employees themselves. Entrepreneurs, of course, will also need to buy insurance for themselves. Choosing not to buy insurance in 2014 will cost someone $95 or 1% of their income, whichever is higher. In 2015, it's $325 or 2% of income. Penalties rise each year after that. For cash-strapped entrepreneurs, it's an added burden as they struggle to run their businesses. Insurance exchanges: Starting in 2014, solo entrepreneurs and small businesses can shop for less expensive insurance through exchanges in each state. One-person businesses can turn to exchanges for individuals. Companies with up to 100 workers may turn to Small Business Health Options Programs. Both have a similar approach to bringing down costs: increasing the size of the insured pool spreads out risk. No exchange is up and running yet. In theory, though, they will give small firms the long-awaited ability to buy insurance at rates that once only belonged to large companies. The federal law ordered states to create them, and a dozen have already started establishing them. Tax credits: Some small businesses will remain eligible for the existing health care tax credit, which will stay in place. Since 2010, the federal government has rewarded companies for providing health insurance if they have fewer than 25 workers and pay average salaries of $50,000 or less. Unless the program is adjusted, it could remain an underwhelming avenue of government help. The tax credit has proved unpopular, because employers say applying for it involves too much work for too little benefit. Related iReport: Have you been denied health coverage? The credits averaged $2,700 last year per business. Only 170,300 companies received it for tax year 2010, even though the government estimates between 1.4 million and 4 million were eligible. The 80% rule for insurers: Another provision that could reduce health care costs for businesses is the rule that insurers spend at least 80% of every dollar on medical care and not administrative costs. It's welcome news for small employers, which have been paying higher administrative fees for years. If insurers spend less than 80% of premiums on medical care, the law forces them to refund the difference with health care rebates. The medical loss ratio, as the rule is known, is already in place and has led to companies receiving rebate checks. In California this month, 4,400 companies received $3.5 million in refunds from insurance company UnitedHealth.